Being prepared for various occurrences shows maturity and responsibility. It is impossible to be sure when an accident would occur. This is the reason during emergencies people find themselves in desperate situations. Perhaps a few lucky ones are usually able to fix the issue and find a way out of the crisis. Whenever you are faced with auto lock crisis such as broken car keys, lost car keys, malfunctioned transponder key, and more, it is good to have a truck to the car locksmith to repair. Considered one of the fastest growing and dedicated, Auto Locksmith Bradford is the auto locksmith service provider you should contact. Prompt response to our customers' requests is one of the things that puts a difference between our services and other services provided by other companies. In fact, as soon as we receive your request, we always dispatch a group of experts to help you out of your emergency needs. When are you are at home, at your place of work, at the roadside, our expert auto locksmiths will come and fix the issue affecting your car. We come with all the necessary tools for replacing lost car keys or broken car keys. They also carry transponder key programming tools so that if the customer requires such services, it can be easier for our team to deliver them. As an auto locksmith company, we have invested in human resources and tools and equipment required for delivering Excellence Auto locksmith services. We make sure that our team of auto locksmith use the latest technology in delivering services. We also train the team regularly to keep them relevant in terms of the latest trends in the car lock and ignition systems. Apart from having the best and highly trained professional auto locksmiths, we have invested in technology that can help our team program car keys effectively. It is important to mention that unless a transponder key is programmed effectively, it will be impossible to start your car. 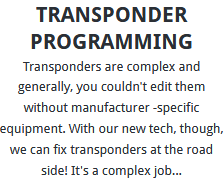 Therefore, our transponder key programming services are effective because they are delivered by professionals using the right tools and equipment. Losing your car keys means that you may not use your car unless you have a spare key. The same applies to a situation where you have broken your car keys. Keep in mind that today's rapidly growing technology has made car manufacturers to increase the level of security of vehicles. They achieve this by designing and creating stats used sophisticated transponder chips. These transponder chips have a pattern that has been saved in the car's memory immobiliser. 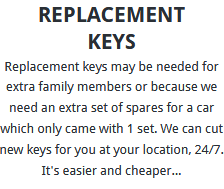 Therefore, if you have to replace the keys, you need an expert who can cut new keys and program them to effectively communicate with your car. Auto Locksmith Bradford is a popular auto locksmith service provider that has been in operation for many years. Our primary objective is offering outstanding services related to car auto locksmith in Bradford and the surrounding areas. Client satisfaction is our primary goal and so, all our existing and prospective clients in Bradford and neighbouring cities can be assured of immediate help when faced with car ignition and lock issues. Why should you consider us for car locksmith services? As a company, we have assembled a team of expert auto locksmiths who are highly trained and experienced in offering excellent auto locksmith services. They have a broad knowledge on opening, repair, and various types of car locks systems. They can deal with isolated and complex lock systems from the popular mechanical to transponder keys and even do transponder chip programming. With our unbeatable auto locksmith services, you can save the money and time you would have otherwise lost if you were to tow your vehicle to a dealer to solve the lock and ignition problems. In fact, our experts usually come to your location and fixed the problem. This is not only convenient for our clients but it saves them money and time. In some cases, people accidentally lock their car keys inside the car. When this happens, you don’t have to use metallic rods to try opening your car. Such harsh methods can damage the car and that means extra expenses. 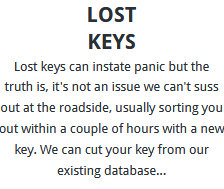 We are experts in opening cars, replacing broken car keys and lost car keys, as well as programming transponder chips for transponder car keys. With our 24-hour emergency auto locksmith services, we can replace your keys anytime of the day. Whether you wanted to drive home after a late night party or you wanted to attend a business meeting and can’t seem to find your car keys, we will ensure you get new car keys within the shortest time possible. When delivering our services, our major objective is always having our clients satisfied with the quality of the services we offer. That is the primary reason we have recruited professional auto locksmiths. Besides, we have invested in the required and latest technology to make sure that the services we deliver are flawless. Besides, we value the safety and aesthetic value of your car. Therefore, our clients can be assured that we will not cause any further damage to their cars’ physical look, locks, and ignition systems. Our technicians are experienced in extracting broken car keys from the lock and ignition system safely. This means that you will not replace the car lock or the ignition cylinder. 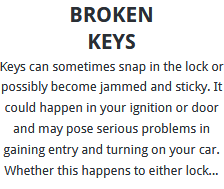 However, if the broken key has badly damaged the ignition cylinder or the car lock, you may need to make the necessary replacements.